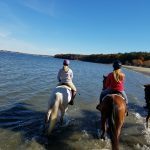 Today was the West Greenwich Horseman’s Association Turkey Trot at Goddard Park in RI. 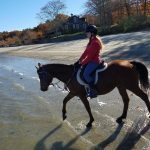 I rode Mojo, Anna rode Amira, Vicki rode Duchess, and Amanda rode Huey. 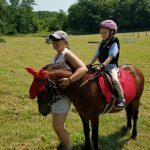 Alex had another commitment for today, so Alexis joined us and rode Teddy. 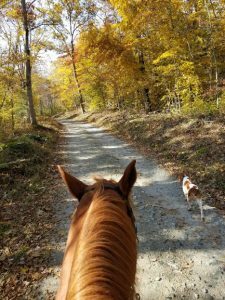 We all enjoyed the crisp fall air and beautiful colors of fall. 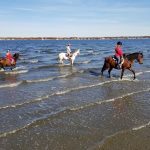 The horses had a good time riding on the beach and were willing to go out into the water. 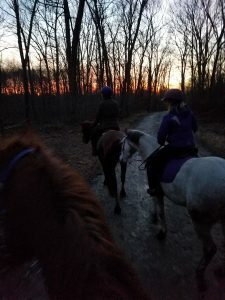 Anna and Alex did get a late evening ride on Friday. 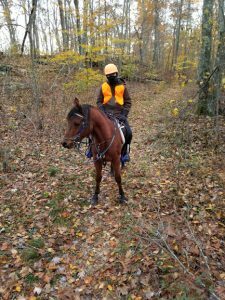 Anna has been enjoying some time out in the woods during the day, and even took Mojo and Rusty out earlier this week. 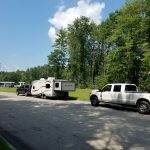 5 riders, 5 horses, 3 dogs, 2 trucks and trailers, 8 days in Fryeburg, Maine. 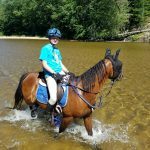 Team “No Child Left Behind” completed a total of 10 Limited Distance 25 mile rides in 5 days of competition. 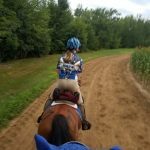 All year, our family has been looking forward to the Pine Tree endurance ride week, which is held out of the Fryeburg Fairgrounds in Maine. It was the family’s top priority for “vacation” this year. The logistics associated with packing for an 8 day trip with 5 horses, 5 riders, and 3 dogs is daunting. We maintain a packing list that gets tweaked with each trip and customized a little depending on the location. 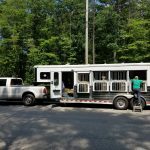 We departed CT on Sunday, 8/5, but we started packing and loading trailers. on Wednesday. 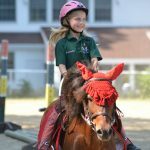 Luckily, a local rider offered to deliver hay to the Fryeburg Fairgrounds. We took 8 bales with us and purchased another 15. The weather on Saturday was heavy rain, so it was good that we decided to move up our timeline and have most of the packing done by Friday. Horses never seem to completely cooperate with plans. 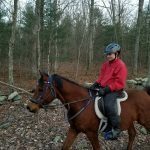 Rumor has it, Vicki whispered to Duchess on Friday that she was going on a big trip to ride lots of trails. 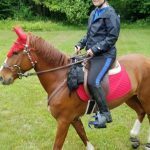 Duchess apparently wasn’t fond of that idea and came in out of the pasture limping on Saturday evening with a twisted shoe on her left hind and a swollen fetlock. I replaced the shoe and Duchess got legs wrapped. 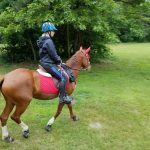 We didn’t give her any anti-inflammatory medications in hopes that she would be sounds enough to ride before the week was over. Sunday morning, we got up and hit the road by about 10. 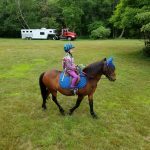 Since we were taking both the travel trailer and horse trailer, Anna and I both drove. 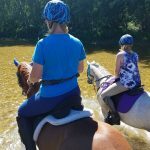 We managed to cover the 230 miles with only a single 40 minute lunch stop, that included feeding all members of the family, walking all 3 dogs, refilling horse hay, and offering the horses water (which they wouldn’t drink). The temps were over 90F so we kept on moving to get to the fairgrounds. 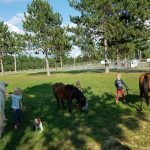 We arrived at camp at set up the electric fencing for the horses and our area. The rides didn’t start until Tuesday, but we went up a day earlier to ensure we had a good spot and enough area for our team. It’s time to explain that the crazy is actually genetic. My parents, Liz and Ken, joined us in Maine. From Alabama. 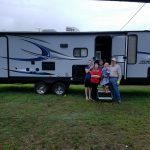 With their travel trailer. The full story is, back in the spring, they asked for our summer schedule to figure out when they could visit. I gave it to them. They quite astutely noted that EVERY weekend was booked with something. 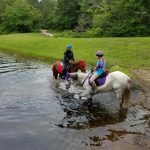 I suggested it might be a good adventure for them to join us in Maine for a week of horse riding/camping. They decided to take us up on the offer. 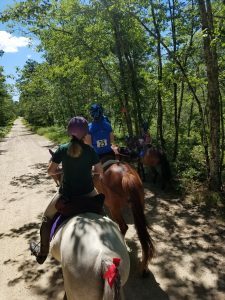 It turned out to be a huge help for us when dealing with 4 riders on trail at a time. And Amanda was happy to move into their trailer. So were the dogs. The week before we arrived in Maine, it rained. 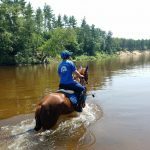 In fact, it rained enough to create questions about the safety of crossing the Saco River, which happens twice on the 25 mile rides, and 6 times on the 50 mile rides. 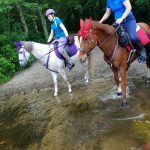 On Monday afternoon, we tacked up the 4 horses who were sound (Duchess wasn’t) and went for a short 3 mile ride to include two river crossings. 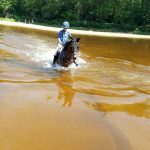 It was good to let the horses stretch their legs, but we also needed to know if Huey would have to swim the river or could touch. Huey only had to swim a little and the river was dropping quickly by the day. 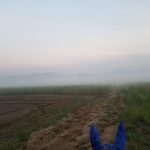 We were also a little concerned about the temperatures on Tuesday – highs were predicted in the mid 90s with high humidity driving the heat index well over 100F. The ride management moved the ride start to 5:00 to try to beat the heat as much as possible. We had some concerns about Huey’s fitness for handling those conditions, but decided that if we went slow, he could probably finish in the allowed time. So it was settled. 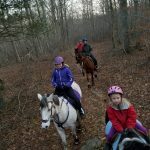 Tuesday ride was Rob on Mojo, Anna on Amira, Alex (15 years old) on Teddy, and Amanda (8 years old) on Huey. 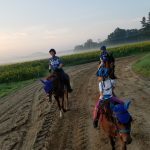 We you are starting a ride at 5 in the morning with 4 horses and kids involved, that means you get up at 3. On “vacation”. For “fun”. 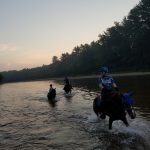 The river crossing and fields were gorgeous as we rode during the sunrise. One of the challenges of Pine Tree is there is an away hold. That means that the vets do a check on the condition of the horses, but it’s not in base camp. This is where my parents came into play. 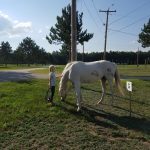 They loaded up the horse feed and people food (along with tack and other items we might need) and met us at the hold to assist with cooling horses and refueling kids. It turns out, there were not a lot of entries on Tuesday. Maybe because of the heat. As a result, our 5:07 ride time was good enough to place in the top 10. I should note, you only have 5:15 to complete the ride. We did exactly what we planned and made sure not to overdo it with Huey. Despite only having 8 minutes to spare, we didn’t turtle, which was surprising. In endurance, the “turtle” is the last rider who completes the ride in the allowed time (those who go over time are disqualified). Since we made the top 10, we had 3 of the horses stand for “Best Condition”. Pine Tree elected to give out a “High Vet Score” award this year, which is one of the components of the Best Condition scoring. 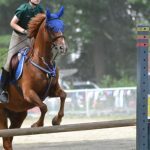 At the awards ceremony, we were completely shocked to find out that Huey, a 17 year old Dartmoor in his first ride, won High Vet Score; the prize was an amazing blanket donated by one of the other riders. Not only that, I got confirmation from AERC that Huey is THE ONLY Dartmoor registered in AERC. The rest of Tuesday was spent recovering. Amanda fell asleep for 3 hours. We went to the river for a swim to cool off and everyone was ready for an early bedtime. Wednesday was a day off. We needed to recover a little from Tuesday and the temperatures were still high. 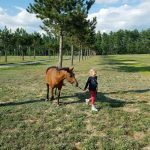 We basically hung out at camp and took care of the horses. The kids did go on a short hike with Grandma and Grandpa. While they were gone, I worked on Amira’s shoes. On Tuesday, she managed to lose 2 shoes (1 front and 1 hind) in the first 10 miles of trail. 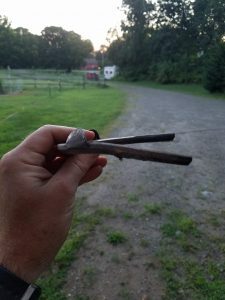 I had all my shoeing supplies with me in case we needed anything, so I pulled her remaining shoes and made some changes to her setup. She was only put into shoes for the first time ever 4 weeks before the ride. 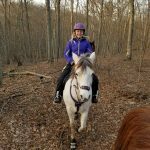 I suspected I needed to put her in a smaller size shoe, but on the trails at home she wasn’t interfering so I rolled the dice. I lost. 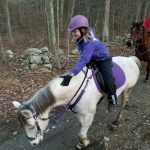 In the ride, she was moving with a new level of determination and interfering whenever she was in the front of our group. 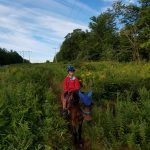 Amira wasn’t exactly cooperative during her shoeing on Wednesday, but the change was exactly what she needed for later in the week. 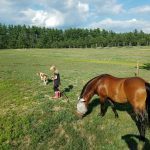 We took the horses for a little evening hand walking and grazing. 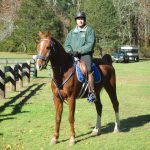 Since Duchess was still borderline on soundness, we decided Vicki would ride Teddy on Thursday and Rob would ride Mojo. The start time on Thursday was 5:30. We got up at 3:30. On vacation. Again. Mojo and Teddy were in great shape and had plenty of energy. More riders had arrived in camp by this point, so our 4:02 ride wasn’t in the top 10, but we had a blast completing our 25 miles. 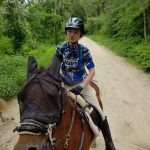 It was still hot in the upper 80s and Teddy was a little sore in his legs after the ride, but not enough to be a big problem. At least that’s what we thought at the time. 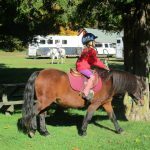 Over the course of the week, 2 other girls (with ponies) in Amanda’s age range (7-8 years old) had arrived in camp. 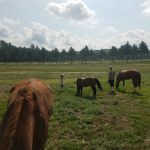 The three quickly became great friends and even spent time grazing ponies together. Friday was another day off. This time, I volunteered as a scribe for the vets. 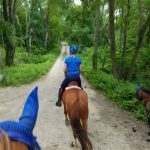 It was very educational because I got to see how the horses at the front looked compared to the middle of the pack. I also got to see what various problems looked like with soundness, tack galls, and dehydration. Friday afternoon, we assessed Duchess and decided she was sound and could go on a test ride. 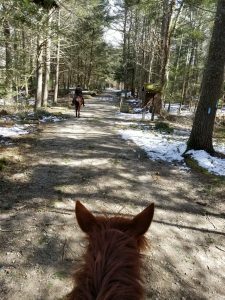 We tacked up all 5 horses and went out for 4 miles. 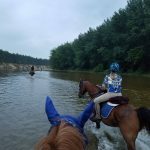 We needed Duchess to go through the river and do some faster work to make sure we didn’t still have a lingering problem. Duchess looked great and had plenty of excess energy from not working all week. 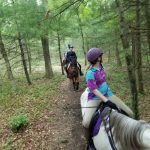 So, the plan for Saturday was all 5 horses and all 5 riders. Saturday morning, we got up one more time at 3:30 for a 5:30 start. On vacation. Unfortunately, during a quick trot out before the start, Teddy was lame. 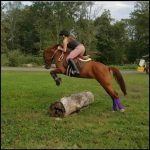 A quick probe of his hind leg muscles revealed extreme sensitivity and some residual cramps. Grandma noted Alex was actually smiling when he got told to untack Teddy and keep him in camp. Alex enjoyed his ride on Tuesday, but was fine with only doing 1 25 miler for the week. 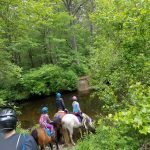 So, we headed out with Rob on Mojo, Anna on Amira, Vicki on Duchess, and Amanda on Huey. 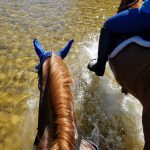 Over the course of the week, Amanda had figured out that she could keep her feet dry if she took them out of the stirrups. 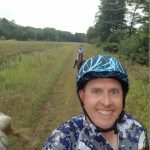 Friday night, the temperatures dropped into the 50s and the highs were only in the low 70s during the ride. 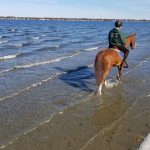 It was a welcome change after a week of heat, but the temperature drop likely contributed to Teddy’s tight muscles. 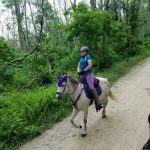 The 25 miles on Saturday were great for Mojo, but young girls who have been in camp all week and already spent a lot of time in the saddle can be challenging on the last ride of the week. We all completed the ride, but there were a few tears (from sore legs and kids who didn’t want to trot any more). We finished around the 5 hour mark. Again, the ride was small on the last day as many riders headed home, so all 4 of us were in the top 10. We competed for Best Condition, and this time, the shock was that Duchess won High Vet Score! 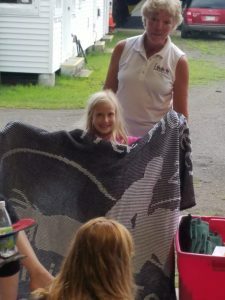 Vicki also got a great blanket! Throughout the week, Amanda insisted on handling Huey for her vet checks. 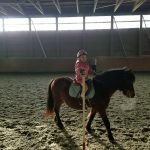 She occasionally needed some assistance, but she did a great job with her pony. On Sunday morning, we were not in a rush to get out of camp since it would only take about 6 hours to get home. As a result, we got hired by some other riders to clean their stalls before we left. We hit the road around 10 and did the drive home with only a single stop again. 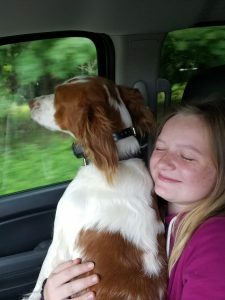 About 8 miles from home, Rusty got tired of laying in the floor and decided to sit with Vicki for the last few miles. Overall, it was a great ride week. 10 rides, 10 completions. We look forward to next year! As most of our friends and blog followers know, we stay pretty busy. Lately, that has been an understatement. 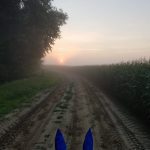 While I would like to be going to bed right now, I feel we are way overdue for a blog update, so I’ll get to it with a few recent highlights. 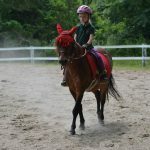 The kids participated in the Mystic Pony Club summer camp last weekend. Alex took Mojo, Vicki took Duchess, and Amanda took Huey. 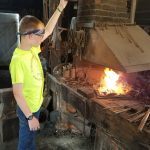 The temperatures were in the mid to upper 90s every day, but the kids did 2 lessons each day. 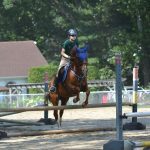 Heather Navarrete was the instructor for 5 of their lessons and all 3 kids made very good progress on their eventing. Alex and Mojo turned out to be an excellent match. 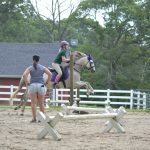 Amanda and Huey even did a small cross country course on the last day of camp. 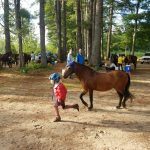 Here are a few videos of the kids practicing cross country and pictures from camp. 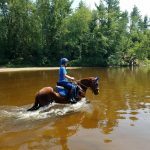 After camp ended, the horses and kids got a couple of days off. I was fortunate that work gave us an extended 4th of July holiday. 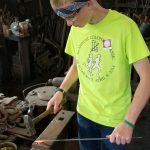 On Thursday, Alex and I went to the Mystic Seaport for a blacksmith private class. 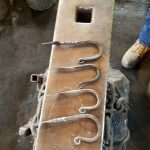 We spent 3.5 hours in the shop learning about tending a coal forge, different tools, and actually making some hooks. This is something Alex has been interested in for a while so we bought some lessons for his birthday last month. 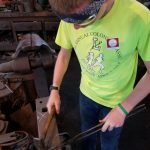 I have been working on acquiring some tools so we can do some projects at home. 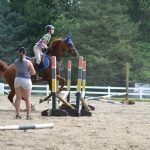 On Saturday, we took Mojo and Duchess to the Horse Power Farm jumping derby. 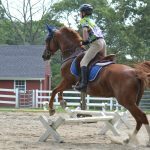 Alex rode Mojo in the pre-elementary division. They did pretty well with only 1 refusal. Alex was a little surprised at how hot Mojo was on the course because Mojo is so lazy in the warmup. It was a little funny to watch Mojo come alive out in the open. 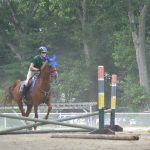 Vicki rode Duchess in pre-elementary and also had 1 refusal (on the same jump as Alex). They are still making good progress as a team. 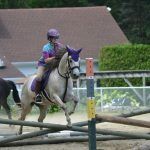 After they finished, I rode Mojo in Beginner Novice. My ride didn’t go quite as smoothly as I was thrown on the 7th jump. 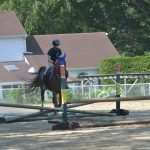 I was allowed to get back on and finish schooling, but then had 3 refusals on the last jump. Clearly we have work to do. 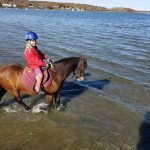 The schedule for the summer is packed with horse activities, but that’s just what we do. 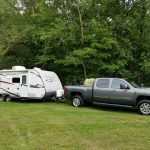 This weekend was the NEATO campout at Arcadia WMA in RI. 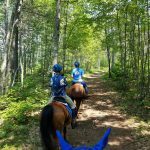 We logged over 6 hours of saddle time and 29+ miles of riding. 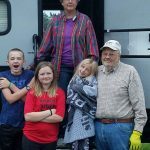 It presented the perfect opportunity for our family to test out camping with the travel trailer (without hookups), 5 horses, and multiple days of riding. Friday afternoon I traded in the Acadia for a used Chevy 2500HD. It was a decision Anna and I have been debating for a while and we finally found the deal we were looking for. 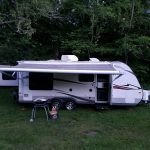 Within about an hour of driving the truck off the lot, it was hooked up to the travel trailer and we were headed out to set up camp. 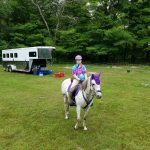 While the camping area only had a few others staying over, we practiced setting up in a compact manner as will need to at endurance rides. It took about an hour and a half to set up camp. 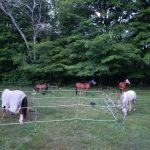 We made 5 electric fence paddocks for the horses (each horse in a separate paddock). None of the paddocks shared sides so if any 1 horse runs through their fence, it doesn’t result in other loose horses. 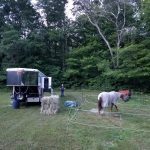 Once the horse were settled in, we cooked some burgers on the grill and at dinner (a little after 9)! One of the major advantages of this weekend was the proximity to home. 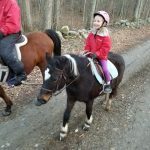 Anna left before 10 and went home (less than 20 minutes away) to take care of the dogs, rabbits, and horses not at camp. 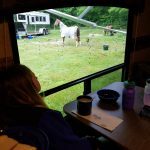 With temperatures in the 50s overnight, we slept great and the horses were not bothered by bugs. 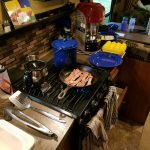 We got up Saturday morning and cooked eggs and bacon for breakfast. 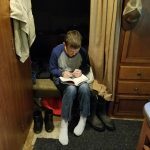 Alex spent all his spare time reading books and finished 3 books over the weekend. The temperatures on Saturday stayed in the 60s. We had a couple of small rain showers early, but nothing too bad. 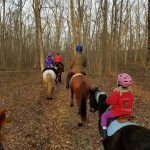 We finally headed out about 10 for our morning ride. 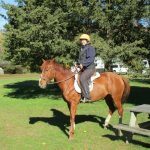 The horse/rider combos were Rob on Mojo, Anna on Amira, Alex on Teddy, Vicki on Duchess, and Amanda on Huey. We got in 11 miles before lunch at about a 4.5mph average. The point of the weekend wasn’t speed, but rather logistics. 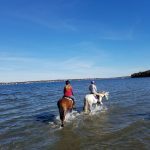 We spent time working on things like walking horses into water, fueling the riders, and taking turns with leading the group. 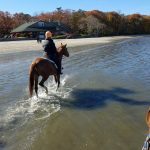 While drinking from the creek, Amira and Huey both slid off the sand bar and went for a swim. What is a “little deeper” for Amira was a complete swim for Huey. Amanda loved it. When we took them in a pond for water, Amira discovered it was fun to splash lots of water up onto her belly. Overall, it was a good morning ride. 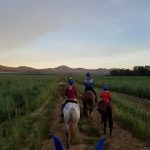 All the horses had excellent heart rate recoveries and were happy to eat some hay and drink some water when we got back to camp. We had lunch and then retired to the trailer for an afternoon rest (also known as napping). 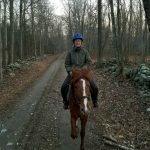 We went back out for another slow and easy ride before dinner that was just shy of 5 miles. Dinner was tacos in the trailer and then we joined up with some others for a campfire. Again, Anna headed home to take care of the others. It’s easy to get kids to go to bed after 3.5 hours of riding. Sunday morning was a little slower starting as we slept in a little. More eggs and bacon to start the day and then we saddled up to ride. The temperature was a little warmer (70s) and a little more humid. The horses were all a bit calmer than on Saturday. We focused the ride on forced fueling as we had some issues on Saturday with some (Vicki) constantly running out of fuel. This is a recurring issue that we haven’t completely solved. We are making progress, but it comes down to forcing her to eat every 30-40 min on the trail. When it was all done, we rode over 29 miles and spent over 6 hours in the saddle. Mojo and Teddy both still pulsed down with no problems. 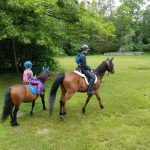 The ponies and Amira were a little slower pulsing down after the last ride, but all 3 would have met endurance ride criteria. 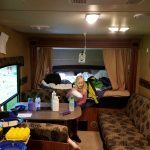 We used ALL of the water in the travel trailer. In the future, we will use paper products when dry camping to minimize the use of water for washing dishes. 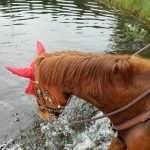 Horse water. 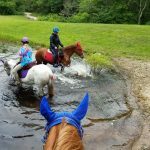 We used over 90 gallons of water for the horses in under 48 hours. That doesn’t include what they drank on the trail. Right now we take a water tank in the trailer that is full, plus 4- 7 gal water jugs that can be refilled. We may add another water tank to the bed of the truck. Electric fence. Our setup is pretty good they way we have it. We can streamline a few things by adding a few more extension cord reels for storage, but it’s not critical. Tack. The tack for all the horses is working pretty well. 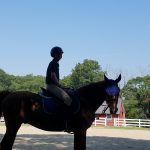 We are debating changing out Teddy’s saddle and bridle setup, but what we have works for now. Boots. Amira and Huey are still being booted. We had boot problems on Huey 4 times. I think it’s time to put him into shoes. Probably Amira too. 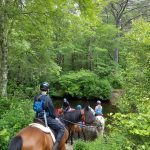 At the end of the weekend, we all had a good time and all the horses are ready to go to Pinetree in 6 weeks. 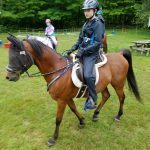 We will continue to train and plan for a week of camping with 5 horses! 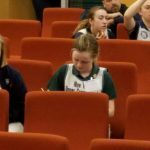 This weekend was busy with horse knowledge competitions. 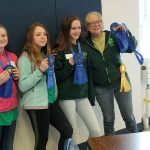 Saturday, Anna went to the CT 4-H Hippology competition with Vicki and Amanda. 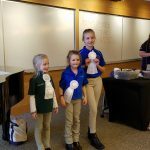 Vicki and Alexis were competing as Juniors in the 10-13 year old division on a team with another member of the Happy Hoofbeats 4-H Club. 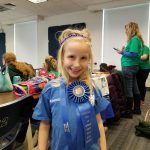 Amanda was in the Novice division, 7-10 year olds, that all compete as individuals. Hippology consists of a written test, slide identifications, stations, horse judging videos and team group questions. 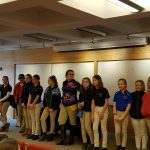 Vicki’s team took 1st place in the Junior division and Amanda had the high score for the Novice division. 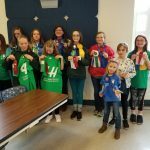 Vicki’s team – 1st place! 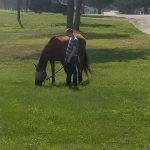 While the girls were away, Alex spent the day with riding with me to trim some horses, starting with a visit to see Nike. Alex groomed Nike and was happy to reconnect with his buddy. 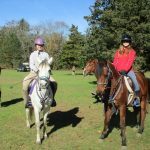 On Sunday, Vicki and Amanda went with me to the Regional Pony Club Quiz Rally to represent Mystic Pony Club (along with Alexis). 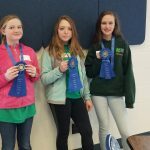 In this competition, Alexis was competing as a Senior, so it was the first time in a long time that Vicki and Alexis haven’t been on a team for quiz. Since we only had 2 Juniors, Amanda and Vicki ended up on different teams -but they didn’t mind. 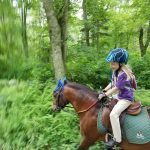 Pony Club quiz is a team competition with team made up of 3-4 individuals. A 3 man team is a disadvantage as a 4 man team can drop the lowest score for each competition phase. 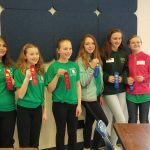 The kids also get individual scores which determine individual placings for high score and national intent. The phases of the competition are written test, stations, barn phase, mega room and class room. 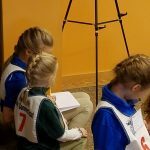 The stations score is not included in the individual score because it is a team effort (everyone works together to answer questions). 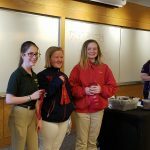 All 3 girls did a great job. 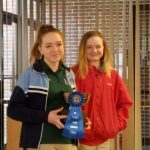 Alexis got the highest overall individual score and was presented the trophy by Vicki, who won last year. Vicki had the high score for the Jr D’s and 3rd overall individual. Amanda is clearly learning from her “sisters” as she was 10 of 24 Jr D’s and actually outscored 3 Jr and Sr D’s with National Intent. 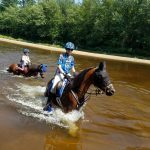 Alexis and Vicki both qualified for Nationals and will be the team captains for the Sr and Jr D teams respectively when they go to Tryon, NC in July. 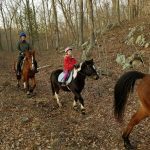 Meanwhile at home, Anna and Alex went for a 2-hour trail ride on Teddy and Amira. Amira had a tough time keeping up with Teddy today as he was feeling good and showing off his moves. After weeks of frigid temperatures, this weekend was a welcome relief with highs in the upper 40s. 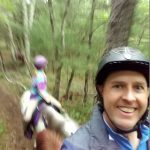 Saturday morning, Alex took Dakota out for a short solo trail ride. 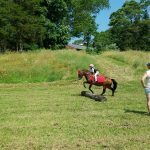 Saturday afternoon Vicki rode Duchess and Amanda rode Huey at Pony Club games practice. This was Duchess’ first group practice and she did awesome. This morning started with 4 hours of tack and tack room cleaning to kick off the ride season. After a break, we tacked up for a ride. 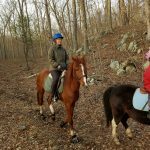 As usual, I took Mojo and Vicki rode Duchess. 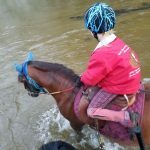 Alex rode Teddy, which will be a regular occurrence this year as they will be competing together at endurance rides. Amanda elected to ride Devil, which was interesting, as Devil is a lot hotter on the trail than Huey. 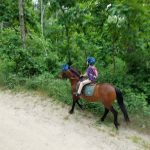 Finally, Anna rode Amira for their first time in the woods. 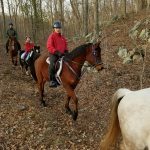 Here is a short video of our group trotting (and maybe a little cantering) up a hill. 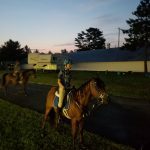 We rode for 1:15 which was just about perfect for today. The temperatures were dropping, but everyone had a good time. 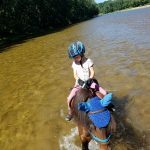 Amira did great – she crossed water without hesitation, took turns leading, following, and bringing up the rear of the group. Amira fits in well with the herd and had a great first outing. 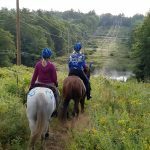 The sun set before our ride ended and we got to ride in at dusk with another beautiful New England sunset. 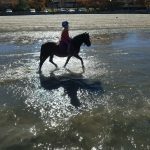 If 6 horses are good, 7 must be better! 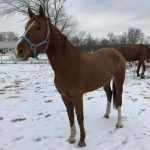 Today we brought home a 6yo, 15hh chestnut BLM Mustang mare named Amira. 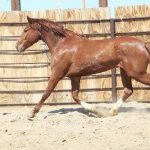 On 2/15/2012, Amira was captured as a yearling from the Stone Cabin Horse Management Area (HMA) located in Nevada. Here is a link to the information about Stone Cabin HMA. She lived in the holding pens until October of 2015 when she was processed for an internet adoption and shipped to Rhode Island. 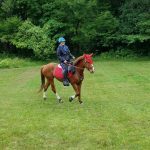 She was only started under saddle about 8 months ago by local trainer Jeremy Reid. 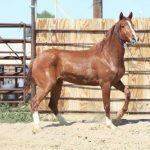 We watched Jeremy compete at the Mustang Makeover in 2015 and we were impressed with his talent. From what we have seen of Amira so far, he did a good job. 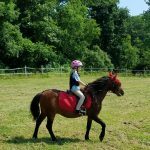 Amira went to a new home where she continued to get training, although life commitments led the owner to offer her up for sale. Amira lived at Outback where we boarded our own horses in the past, and she even had the stall that Precious once occupied. Anna kept remarking about how similar Amira and Precious look, although Amira has a few inches on Precious (maybe 10″). 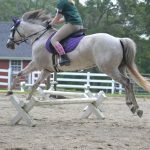 Although Amira is 15hh, she has a very narrow build. 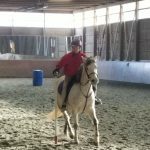 Our primary objective with Amira is distance riding and she will fill that niche as a possible mount for multiple family members. 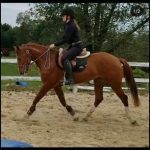 With that said, she is Anna’s horse and Anna will be doing the majority of the continued training with her, including lots of trail work, dressage, and jumping. 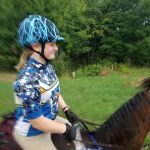 We have big goals this year of doing a lot of distance riding and everyone is looking forward to our ride schedule. 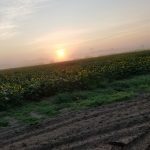 It was late when we got home, so I don’t have any pictures from our farm to share, however, I did steal some from her sale ad. If you want to follow along with the adventures of Amira and the rest of our herd, you can always subscribe via email on our website.